Delta 36-L336 3 HP Motor Uni-saw with 36 in. Biesemeyer Fence System is ideal for woodworking, cabinet making and boat building. It features speedometer style scales and a 36 in. Biesemeyer fence. The 3 HP, 230-Volt motor cuts hardwoods and engineered products like MDF and melamine. The riving knife enables tool-free adjustment for through and non-through cuts including grooves for shelves and picture frames as well as dadoes, rabbets and cheek cuts for furniture. Tbook.com crawls the web to find the best prices and availability on Table Saws and related Tools and Hardware products like Delta 12.5 Amp 3HP 10 inch Unisaw Table Saw with 36 inch Biesemeyer Fence System. 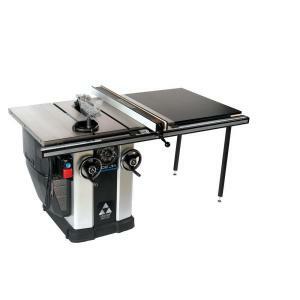 For this page, related items include products we find that match the following keywords: "Table Saw" at our vendor partner Home Depot. Delta 12.5 Amp 3HP 10 inch Unisaw Table Saw with 36 inch Biesemeyer Fence System is one of 60 Table Saws and related products listed in the Tools and Hardware section of Tbook.com If you have any questions on this product, please give us a call at 734-971-1210 during the hours of 9am - 5pm EST for assistance. Thank you for shopping at Tbook.com, the Internet Department Store!